If you think this is a pizza you’re right. Jazzi sent this to me as a howliday gift some years ago. I loved it then, and I love it now. Time to chew on a good toy today! Why? Because it’s Tuesday that’s why. Thank you my Angel Jazzy friend. I miss her. She’s over the bridge. Sigh. But it’s always nice to remember, don’t you think? Sweet. Pulled another one out of my hat. 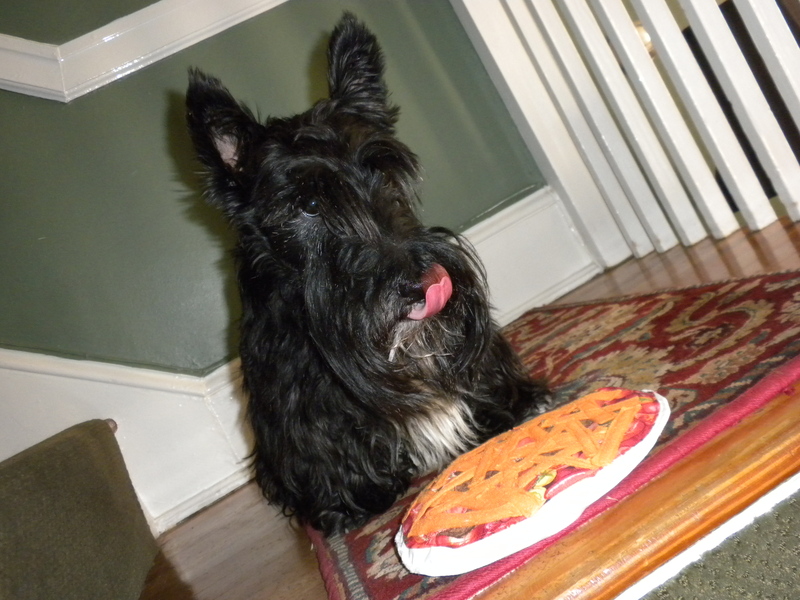 This entry was posted in The Scottie Chronicles and tagged dog toys, friendship, pizza, Scotties, Scottish Terriers. Bookmark the permalink. OK…you lucky dog…..ya pulled that Mothers day out the fire…………….have your pizza….we are having real rib bones tonight….we can smell them a cookin now! I miss Miss Jazzi also. Love your Peep! She has the right ‘rude! Isn’t it wonderful to have the love of friends, and the memories of the friends we loved, who loved us too, before they went over the bridge? But the best love is the love of a Peep, who would do anything to keep us happy, healthy and safe from harm. Yes, Stuart, you lucked out in the friends and Peep department. All dogs should be so lucky. I know I am. Great picture! Memories of Jazzi, priceless. We always cherish things given by our good friends. Here’s to Jazzi, Kyla, and all of our other friends playing nicely with our Corky, Drew, Tiffany Sue, Lexie Lou, and Tory. Jazzi was a great lady. Jazzi rocked! Mazie stole a piece of Mom’s pizza tonight MOL!